An article here goes into all this in a little more detail. Essentially, the ultimate aim of stripping away the externals of negatively-interfering footwear is to enable your body to function more naturally, more efficiently and more effectively. The running opportunities that decision ultimately proffers can take people, in my experience, from ‘about to hang up their trainers’, to signing up – and completing – an endurance event. Some have ‘nutshelled’ that as ‘getting their life back’. Having mused on the purpose of reconsidering running footwear options, the next consideration is the respect that the transition process demands. Whilst getting fitter/stronger/faster is a likely happy ‘side effect’ of Efficient Running, early on in the journey of transition towards being a runner using his/her body more naturally, more efficiently and more effectively, the focus has to be solely (excuse the pun!) on great form. Speed is initially not the driving force – technique, form and the respect of soft tissue being given an altered job-spec with little or no notice, are the prime considerations. This has the double whammy of protecting yourself from injury during a change in form, as well as protecting you from injury for the rest of your running career – after all, if we run as we’re designed to, rather than to someone’s ‘protocol’, logic would have it that your body is probably ‘up for it’. For A1-types who struggle with the concept of backing off distance and speed in training, have a competition with yourself. Look at the period as being ‘Improvement in Efficiency of Running’. NOT how fast you can run, or for how long you can run, or even how far you can run. It’s about, when it matters, finding your Sustainable Speed and staying there because you’ve unlocked the amazing potential of the biomechanical workings of the human body. The mind-set at the beginning of the transition should be on form – form – form. Think “next time I run, I want to start and finish looking the same; no deterioration in form, despite tiring”. Fatigue is normal and you’ll all fatigue at different rates due to your various fitness levels … from elite/top age-grouper through to social runner, looking for a healthier lifestyle and an enjoyment of your running. Your running ‘times’ at the beginning of your transition are irrelevant. It’s about using your body so well that you make whatever speed you’re running at as easy as possible. And you do that, of course, by running as efficiently as possible. Eventually, you should be running at the same speeds you were running at when you started your transition, but it should be feeling easier! The aim, from now on, should always be to maintain your great form all the way through any length of run, or until the final moments of the sprint finish on race day (tying up on a sprint finish is almost inevitable). Even on an ultra-distance run, my aim is to look the same at the end as I did at the beginning, many hours previously. And I promise you, no-one ever overtakes me on the second half of a run. They may have stonked past when fresh at the beginning, but they’re trudging and flogging themselves as I float past later. Spending as little time on the ground as possible? Running with paw-like feet, totally relaxed? Relaxed from the knee down, accessing ALL the free energy from the elastic stretch and recoil of the calf and foot muscles with each stride? Relaxed from the waist up, accessing ALL the free energy from the elastic stretch and recoil of the amazing posterior oblique slings, crossing your back? Giving your legs space to move by being long and not crouched? Letting your hamstrings and buttocks get on with it? Are you enjoying your running? So, in time, if you take the plunge, you’ll have more speed for less effort … but that only comes when the ground-work is done. Even Tiger Woods took time out to take apart his swing, rebuild it and come back even better than before. Demand of yourself great form and don’t settle for less. It is not acceptable to run fast ‘any old how’ just because you can. Perhaps you can now, but if you’re achieving speed through inefficient biomechanics, and therefore not using your body to its best advantage, it WILL get bothered – sooner or later. 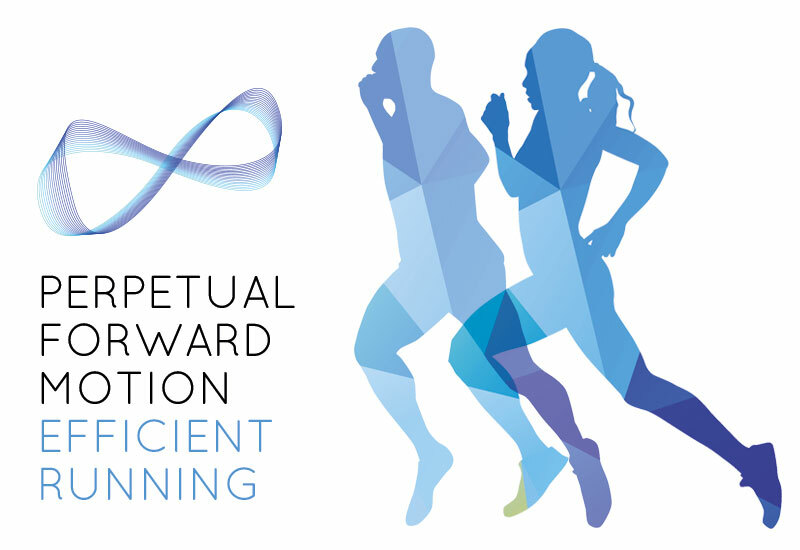 Don’t be a running injury statistic – run clever, run with intelligence. Find all the links of connective tissue offering the opportunity of storing and releasing energy and avoid, at all costs, bothering to defy gravity (you can leave that to the high jumpers) and you solve the mystery of mastering great running form.